Perfect for a romantic getaway, Iberostar Grand Salomé is a 5 star hotel located right by the coast in the prestigious resort of Costa Adeje. Exclusive for adults, couples and small groups will enjoy the peaceful atmosphere and excellent amenities. Suites are spacious and elegant in design. Complete with sea views, hammocks, a whirlpool bath, and a 24-hour butler service, guests will feel truly spoilt. Exclusive services are also to be enjoyed, such as a personalised butler service and unlimited sparkling wine at Salomé Beach Club. Iberostar Grand Salomé will leave guests feeling satisfied after indulging in the range of restaurants and bars, from Italian to local cuisine. The trio of swimming pools and spa will ensure guests experience a truly relaxing getaway, where you’ll find a Finnish sauna, sensation showers, and a range of deluxe treatments. If you prefer to explore there are plenty of opportunities. Situated in one of the most attractive areas of Costa Adeje, guests can opt to take an evening stroll along Fanabe beach or visit the range of bars, restaurants, and casinos. Children under the age of 16 years are not permitted. The hotel has 33 suites and 4 floors. Buffet breakfast. À la carte lunch and buffet or à la carte dinner (reservations required for à la carte restaurants), drinks at selected bars from 10:00–01:00. Snacks from 10:00–18:00. 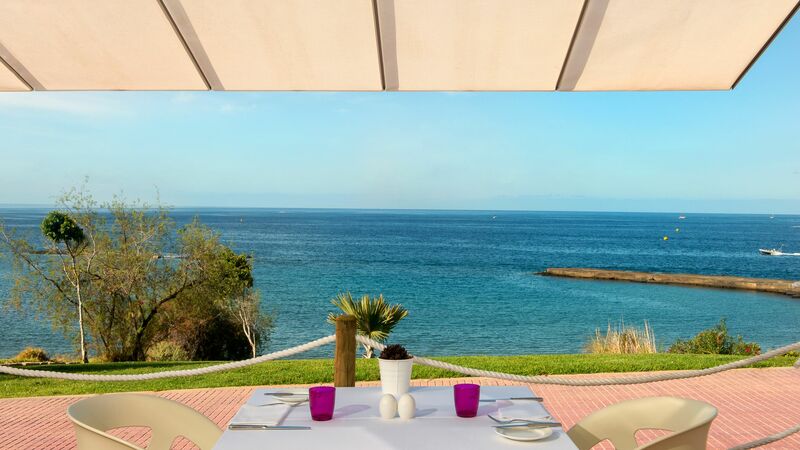 Head to Barbecue Beach Club for lunch to taste delicious Canarian cuisine prepared with fresh, locally sourced ingredients. 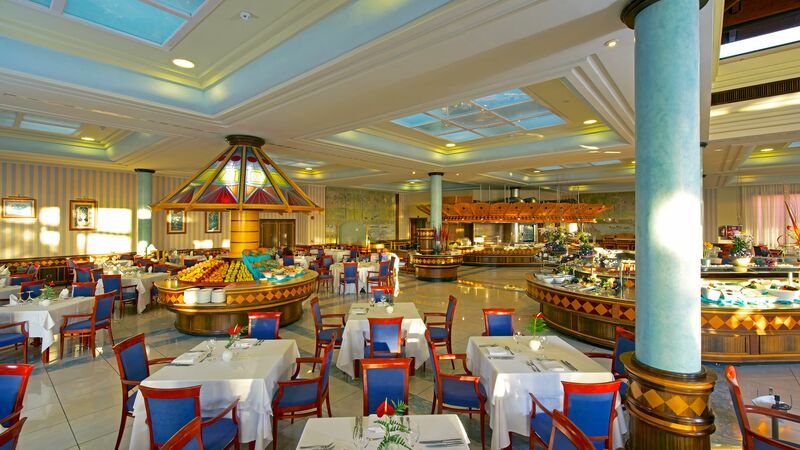 Enjoy a delicious dinner at Portofino for classic Italian favourites such as pizza, pasta, and delicious meat dishes. 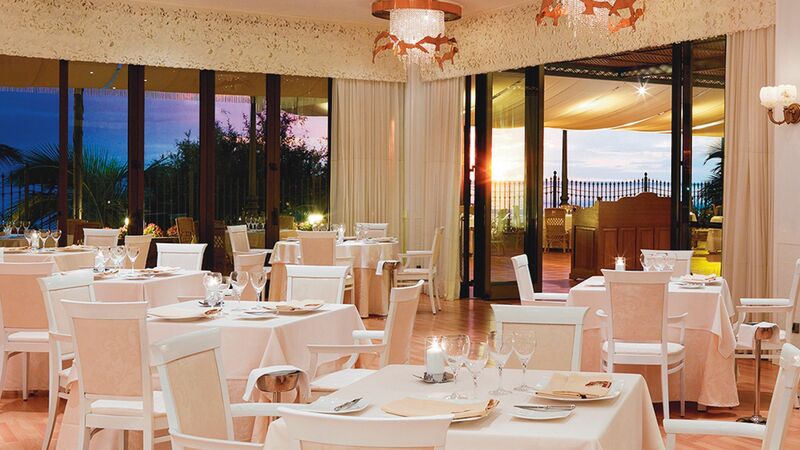 Guests who have booked half board and all inclusive stays can eat dinner at Portofino. Reservations are required and some dishes may be excluded. 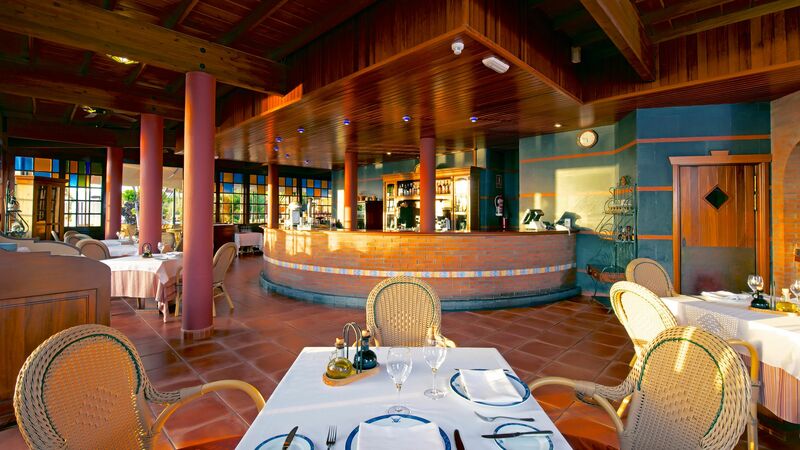 Serving up a twist on traditional Canarian flavours, this gourmet restaurant is renowned as one of the best in Tenerife. Guests staying on half board and all inclusive options can eat at Poseidon. Reservations are required and some dishes may be excluded. 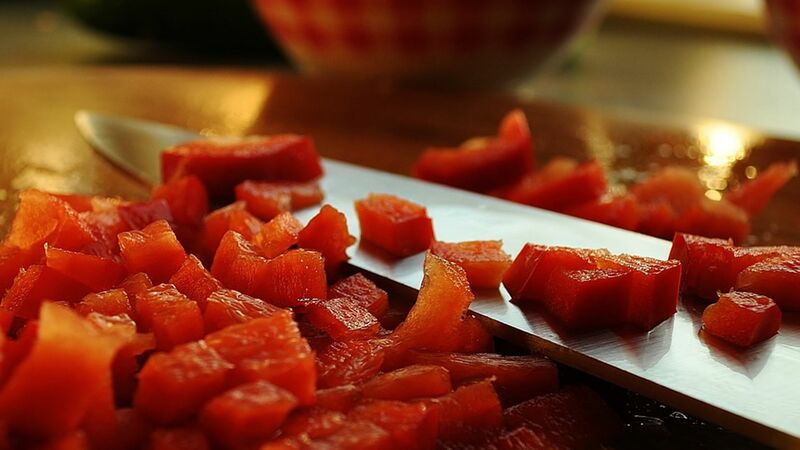 Using only the freshest produce, this buffet restaurant tempts with both local and international dishes. Guests will also enjoy the themed evenings and show cooking stations. Guests on half board and all inclusive can eat at Zeus. Guests are treated to fresh seafood, smoothies, and cocktails with a stunning sea view at SeaSoul. This relaxed poolside bar offers a selection of delicious snacks and drinks throughout the day. Be sure to visit Salomé between 16:30 and 17:30 for Tea and Coffee Time, where a large selection of teas, coffees and pastries await. Or, opt for an á la carte lunch by the pool. Start your morning right with an á la carte breakfast featuring views across the ocean. Enjoy fresh juices, French pastries, and delicious milkshakes. Relax by the freshwater pool, enjoy the infinity pool and its sea views or head to Iberostar Anthelia to take a dip in the saltwater pool. Fanabe Beach stretches right in front of the hotel and offers a long strip of sand and calm waters. Make sure you come back in the evening to watch the sunset with a cocktail in hand. 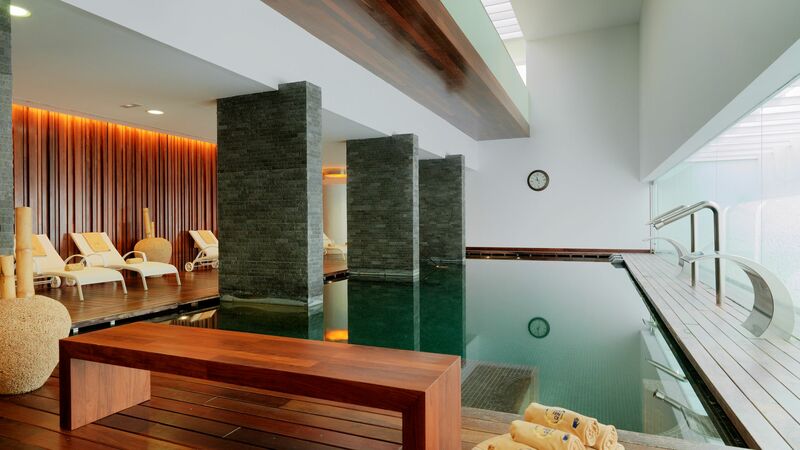 This 1000m2 spa treats guests to a Finnish sauna, heated pool, sensation showers, and a wide range of deluxe treatments. Programmes, such as yoga and meditation are also available. Please note that some facilities may be chargeable. Tennis lovers can head to the tennis court to practice during their stay. Equipment is also available to borrow from the hotel. Located close to the sandy beach of luxurious Costa Adeje, Iberostar Grand Salomé is ideal for those wanting to make the most of the island. Tenerife’s proximity to Africa gives you year round sunshine, with plenty of opportunity to enjoy the imported Saharan sands of the beach. Families visiting with children will love the two water parks which are within a 10 minute drive of the hotel, while adults will find Costa Adeje Golf Course within easy reach. Costa Adeje has long been a favourite with celebrities and others wanting to enjoy luxury holidays in Tenerife. It’s home to some excellent restaurants, trendy bars and plenty of shopping centres full of designer labels. 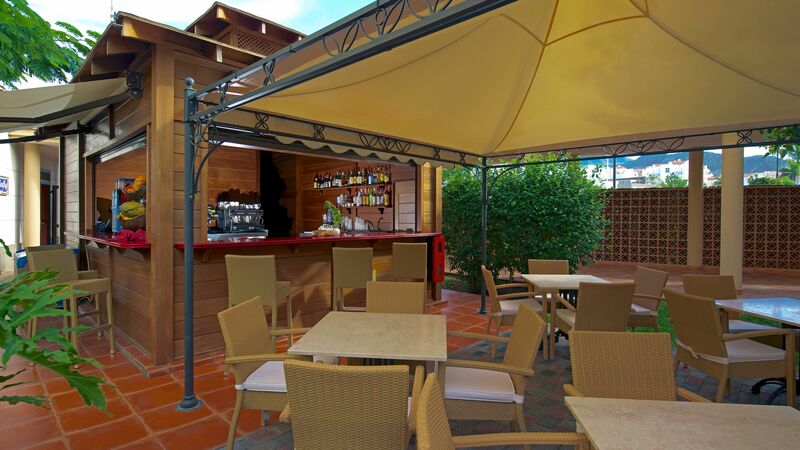 Iberostar Grand Salomé is a 15 minute drive from Tenerife South Airport. Suites are located on the second, third and fourth floors of the hotel and are decorated in soft tones and have a separate lounge and bedroom partitioned by a curtain. The bathroom offers a Jacuzzi® bath and separate shower and the suite features a private balcony with sun loungers and a sea view. Image is an artist Impression. These suites have a classic, stylish décor and feature a separate lounge and bedroom with a king-size bed partitioned by a curtain, whilst the bathroom offers a Jacuzzi® bath and separate shower. They are located on the ground floor with a terrace, and are furnished with sun loungers and boast views of the sea and direct access to the pool and gardens. Superior Suites have a classical décor and have a separate lounge and bedroom partitioned by a curtain. The bathroom offers a Jacuzzi® bath and shower and the suite has a large terrace with a sea view which is located on either the second or third floors or the ground floor with direct access to the pool and gardens. Sovereign guests staying a minimum of 7 nights will receive one complimentary access to the Spa circuit per person per stay, one candlelit dinner per couple at either Poseidon, Portofino or Zeus (valid for guests dining on half board only and drinks are not included) plus one complimentary bottle of Cava in their room upon arrival for holidays until 31 October 2019. Guests staying a minimum of 21 nights will receive 10% discount on the hotel price for holidays until 31 October 2019. Guests staying a minimum of 7 nights celebrating their honeymoon or gold/silver anniversary based on half board will receive one romantic breakfast, a bottle of sparkling wine, a complimentary welcome gift and 10% discount on spa treatments for holidays until 31 October 2019. Wedding certificate must be presented upon arrival and must not be more than 3 months old. “ We had a very enjoyable time. Second favourite in Tenerife. Five star hotels come in many guises and this one is what I would define (unsurprisingly) as a holiday hotel. As such it is nowhere near the standards of say an American Four Seasons or an Indian Oberoi. This is exemplified by small wardrobes, nowhere to store suitcases, nice but not super luxurious fixtures and fittings, pocket doors that don?? ?t fully close due to skirting and cursory turn down among other things. But it is more than a touch above the normal holiday resort. The pool area is lovely. The boast of plenty of sunbeds is correct BUT there is one issue. The location of same. The morning sun is very discriminating meaning there were probably only 5 or 6 pairs benefitting from it. Some of these were commonly reserved by towels and books well before breakfast. This is extremely annoying and unnecessary with so few people about. I don?? ?t think the hotel was remotely full during our visit and can only imagine it will get worse in the high season. Hopefully by then the sun will be more obliging! The butlers were delightful people ??? really could not do enough for us - and room service was speedy and efficient. Food generally was OK but not exceptional. Portofino the Italian was the best we ate in with well cooked salmon and lovely cheesy pizza. A good thing to note is we tried to book a table at the main reception but were refused as it was fully booked for the next three nights. We went on the waitlist and the moment we gave our room number in Salome everything changed and we were offered a table that night ??? there are benefits to being in the *best* bit. Oh and the prawn salad by the pool bar was quite nice too. The only Adults only restaurant in the evening would probably be OK in summer when you could eat outside but in April the inside was very harshly lit and lacked atmosphere so we did not eat there. Enjoy! We moved to the also adults only Corales Hideaway after our stay here. Full review under their listing but totally different. Everything is horses for courses and while Salome has the beachfront and promenade frontage for us Corales has the win. Please don't believe this is an adults only holiday. You will be staying in a section of a bigger hotel. At 6pm every night everything at Solome shuts even the bar. you are then forced to eat with screaming kids and even the night entertainment is full of kids. When paying that much money for exclusively adults only ( their words) you do expect better. As the only time we could go was half term we deliberately booked this hotel to be away from kids. Very disappointed . We have just returned from a wonderful stay at the Grand Salome. It was our first time at this particular hotel but most certainly won?? ?t be our last. We received a very warm welcome from the reception staff on arrival and were then greeted by Kim who was so lovely and extremely helpful. We were shown to our beautiful room which was very special with modern decor and gorgeous views. All the staff are a credit to the hotel and nothing was too much trouble. The hotel is in a fantastic location with plenty of restaurants, bars and shopping on the doorstep. We would like to thank Kim, Diego and all the staff and we can?? ?t wait to return. 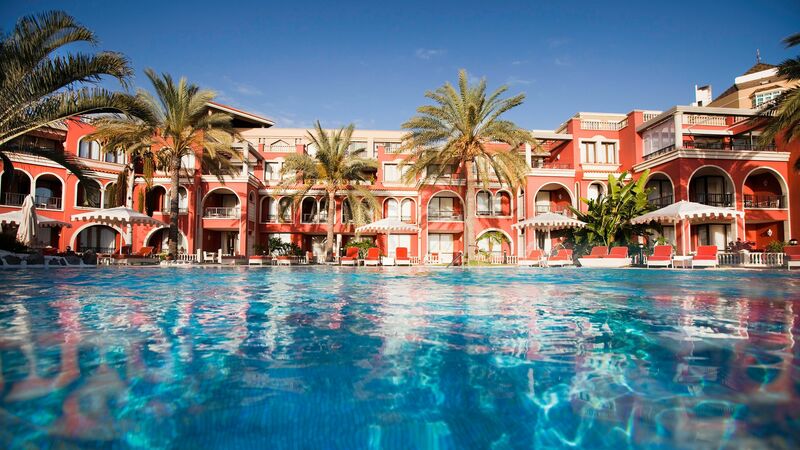 This was our second visit to the Grand Salome in Costa Adeje and again it doesn't disappoint. The suites are just beautifully positioned overlooking the hotel's pool and the sea and so quiet. The breakfast room again, stunning views across to La Gomera, the buffet is very good, but you have the option to cross over into the Anthelia Breakfast room, which has a far bigger choice and take your breakfast to the Salome's breakfast room with the stunning view. The team in the breakfast room are very helpful, very friendly and efficient. The suite was just as last year, but with an eye to the environment with bath products in larger containers attached to the walls, so much better than those fiddly little bottles. The bed is very large, and comfortable, large TV on the wall,a safe that's not fiddly to operate, an Iron and mini ironing board, an excellent hairdryer and straighteners too, never had that before and nice addition. Plenty of wardrobe space, drawers and space for shoes. The sitting room has a large sofa, plus chair, coffee machine, free water delivered daily, fruit and of course a bottle of fiz and chocolate covered strawberries, to welcome you, oh how I love those strawberries! TV lots of plugs, a desk with chair. A very large covered terrace, with table and chairs and sunbeds, with towels, privacy if you want it. The pool is absolutely fabulous, there's no problem finding a place, sun or shade, with double sunbeds or single beds with canopy, a Hydro pool, oh loads of space. There is a check of the pool water on a regular basis, so you know its safe to swim in, what's interesting is the pool side is never busy, so no need to put towels down to reserve your place, lots to go round. Free alcohol at the poolside bar, its just there help yourself. Free afternoon tea with very tasty cakes. The hotel is completely separate from the Anthelia, but we can dip in to their entertainment or drink in the bar listening to the excellent pianist. There is a Spa we didn't use this year, but very good Masseuses. You can eat in the various restaurants in the hotel, but we prefer B&B as there are lots of excellent restaurants within walking distance, one is spoilt for choice. Adeje is beautiful, quiet no loud music and lovely beaches. Something for everyone, we will return. We were on an all inclusive basis. You do share the restaurants with the bigger Anthelia hotel. We enjoyed many meals at Portofino where the food was excellent and the staff were lovely. The buffet at Zeus wasn't bad. The food choice was very good but we do prefer to be served at the table. The fine dining restaurant, Poseidon , was a big disappointment. Serving ice cold red wine and when my husband asked for a port to finish his meal, he requested that it didn't come from the fridge, they heated it up and he couldn't pick up the glass! We cancelled all our other bookings there and wouldn't return! On our anniversary Kim arranged a meal at Seasoul (originally booked for Poseidon!) which is just outside the hotel and open to everyone. The food was excellent and they made a fuss of us too, which made the day very special. We will certainly return to the Salome in the future. Thank you to everyone who made our holiday so very special.